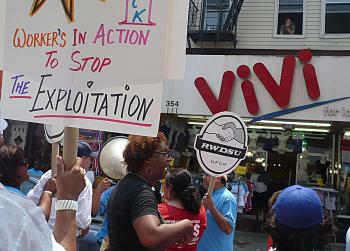 Workers rights organizations in Bushwick, Brooklyn wagged their fingers at two retail stores during a march on Knickerbocker Ave. on Sunday, July 20. A Flushing restaurant accused of religious discrimination could be facing legal trouble and a hefty fine. Round 16 of the AFL produced some important results that impact the final eight. Flushing residents are collecting signatures from passers-by to recall two local politicians. The term “throw-away society” is often used to describe today's culture. Councilman Eric Gioia advocates the installation of energy saving technology in New York City buildings. Dozens of Jewish New Yorkers met outside the Israeli Consulate to memorialize two slain Israeli soldiers. Children have been burned on playgrounds that can reach extraordinarily high temperatures. Interview with Falun Gong practitioners in Flushing regarding attacks. Lotus Festival: Where Have All the (Lotus) Flowers Gone? Everything you could expect from the Lotus Festival was there, except for the lotus flowers themselves! An audit by New York Comptroller William C. Thompson Jr. has found dangerous conditions in senior centers. “Free fruit New York!” called out vendors passing out produce to passersby lined up outside the Port Authority.